I was recently assigned a project in my MFA program that required us to design an informational/instructional poster. It's probably no surprise that I chose to do mine on letterpress. The last few craft fairs I've participated in a number of people have asked me what letterpress is. Being so involved in the process I often forget that many people have no idea what letterpress is exactly and even when people are familiar with the look of the final printed pieces they still have no idea how the process works. 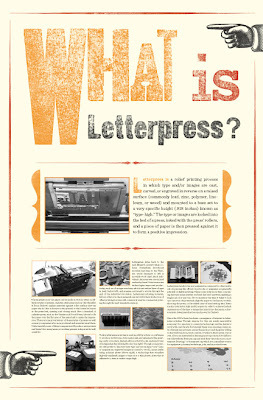 So I chose to keep the subject matter simple and answer the question: What is Letterpress? The final poster design is 25 x 38 inches and uses wood type that I hand set, printed on a Kelsey hand press, then scanned in and added to the layout electronically (above). Unfortunately the text is too small to read on screen. I'll be posting the first part of the text below and the rest will follow in a second post to come. 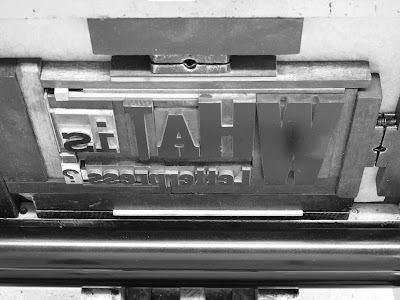 Letterpress is a relief printing process in which type and/or images are cast, carved, or engraved in reverse on a raised surface (commonly lead, zinc, polymer, linoleum, or wood) and mounted to a base set to a very specific height (.918 inches) known as “type-high.” The type or images are locked into the bed of a press, inked with the press’ rollers, and a piece of paper is then pressed against it to form a positive impression. 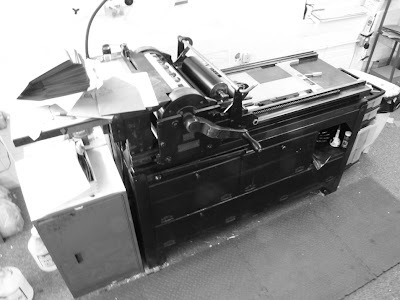 paper sits in (this is known as the platen) to the locked in layout in the press bed, opening and closing much like a clamshell. A cylinder press, such as the Vandercook Proof Press, (below) rolls the paper over the flat area of the press bed to make the impression. 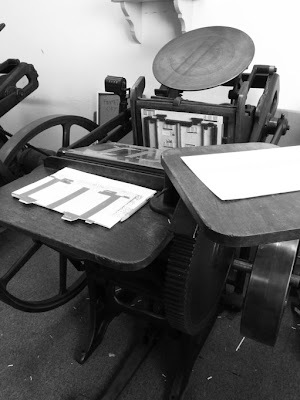 There are many variations of these styles of presses as well as many companies who once produced and manufactured them. Unfortunately none of these companies still produce new presses and haven’t for many years, so working presses today must be well cared for.